In 2016, Pacquiao was ranked second on ESPN's list of top boxers, pound for pound, of the past 25 years. He was named Fighter of the Decade for the 2000s by the Boxing Writers Association of America (BWAA), WBC, and WBO. He is also a three-time Ring magazine and BWAA Fighter of the Year, winning both awards in 2006, 2008, and 2009; and the Best Fighter ESPY Award in 2009 and 2011. BoxRec ranks him as the greatest Asian fighter of all time. Pacquiao was long rated as the best active boxer in the world, pound for pound, by most sporting news and boxing websites, including ESPN, Sports Illustrated, Sporting Life, Yahoo! Sports, About.com, BoxRec, and The Ring, beginning from his climb to lightweight until his losses at welterweight in 2012. He is also the longest reigning top-ten active boxer on The Ring's pound for pound list. Pacquiao has generated approximately 19.6 million in pay-per-view buys and $1.2 billion in revenue from his 24 PPV bouts. According to Forbes, he was the second highest paid athlete in the world as of 2015. At the age of 14, Pacquiao moved to Manila and lived for a time on the streets. He started boxing and made the Philippine national amateur boxing team where his room and board were paid for by the government. Pacquiao reportedly had an amateur record of 60 wins and 4 losses. In 1995, the death of a young aspiring boxer and close friend, Eugene Barutag, spurred the young Pacquiao to pursue a professional boxing career. Pacquiao started his professional boxing career when he was just 16 years old, stood at 4'11'' and weighed 98 pounds (7 pounds under the minimumweight division). He admitted before American media that he put weights in his pockets to make the 105-pound weight limit. His early light flyweight division fights took place in small local venues and were shown on Vintage Sports' Blow by Blow, an evening boxing show. His professional debut was a four-round bout against Edmund "Enting" Ignacio, on January 22, 1995. Weighed just 106 pounds, Pacquiao won via a unanimous decision, becoming an instant star of the program. Pacquiao's name was so accustomed to the viewers not only because of his aggressive, go-for-broke kamikaze-style of fighting, but also of his unique looks and catchy surname. Pacquiao's weight increased from 106 to 113 pounds before losing in his 12th bout against Rustico Torrecampo via a third-round knockout, he was caught with a looping left hand flush on the chin which he couldn't get up from. Pacquiao failed to make the required weight, so he was forced to use heavier gloves than Torrecampo, thereby putting him at a disadvantage. Following the Torrecampo fight, Pacquiao continued undefeated for his next 15 fights. He went on another unbeaten run that saw him take on the more experienced Chokchai Chockvivat in flyweight division. Pacquiao knocked out Chockvivat in the fifth round and took the OPBF Flyweight title. After one official defense and two non-title bouts, Pacquiao got his first opportunity to fight for a world title. Pacquiao captured the WBC and lineal flyweight titles (his first major boxing world title) over Chatchai Sasakul by way of knockout in the eighth round. He defended the titles successfully against Mexican Gabriel Mira via a fourth-round technical knockout. However, Pacquiao lost the lineal title in his second defense against Medgoen Singsurat, also known as Medgoen 3K Battery, via a third-round knockout. The bout was held in Nakhon Si Thammarat, Thailand. Singsurat got Pacquiao on the ropes and landed a flush straight right to the body, coiling Pacquiao over and keeping him there. Prior to the fight Pacquiao lost the WBC title at the scales, as he surpassed the weight limit of 112 pounds. Following his loss to Singsurat, Pacquiao gained weight and skipped the super flyweight and bantamweight divisions. This time, Pacquiao went to super bantamweight, or junior featherweight, division of 122 pounds, where he picked up the WBC International Super Bantamweight title. He defended this title five times before his chance for a world title fight came. Pacquiao's big break came on June 23, 2001, against IBF Super Bantamweight title holder Lehlohonolo Ledwaba. Pacquiao stepped into the fight as a late replacement on two weeks' notice but won the fight by technical knockout to win the title, his second major boxing world title. The bout was held at the MGM Grand Garden Arena, in Las Vegas, Nevada. Pacquiao went on to defend this title four times under head trainer Freddie Roach, owner of the Wild Card Gym in West Hollywood. On November 15, 2003, Pacquiao faced Marco Antonio Barrera at the Alamodome, San Antonio, Texas, in a fight that many consider to have defined his career. In spite of Barrera given credit for knocking Pacquiao down in the first round (as replays showed the punch missed), Pacquiao, who was fighting at featherweight for the first time, brought his power with him and defeated Barrera via technical knockout in the eleventh round, only the second knockout loss in Barrera's career, and won The Ring and lineal featherweight championships, making him the first Filipino and Asian to become a three-division world champion, a fighter who won world titles in three different weight divisions. He defended the title twice before relinquishing it in 2005. On November 24, 2003, the then Philippine President Gloria Macapagal-Arroyo conferred on Pacquiao the Presidential Medal of Merit at the Ceremonial Hall of Malacañang Palace for his knockout victory over the best featherweight boxer in the world. The following day, the members of the House of Representatives of the Philippines presented the House Resolution No. 765, authored by the then House Speaker Jose De Venecia and Bukidnon Representative Juan Miguel Zubiri, which honored Pacquiao the Congressional Medal of Achievement for his exceptional achievements. Pacquiao is the first sportsman to receive such an honor from the House of Representatives. Six months after the fight with Barrera, Pacquiao challenged Juan Manuel Márquez, who at the time held both the WBA and IBF Featherweight titles. The fight took place at the MGM Grand Garden Arena, Las Vegas, on May 8, 2004. In the first round, Márquez was caught cold, as he was knocked down three times by Pacquiao. However, Márquez showed great heart to recover from the early knockdowns and went on to win the majority of rounds thereafter. This was largely due to Márquez's counterpunch style, which he managed to effectively utilize against the aggressive style of Pacquiao. At the end of a very close fight, both boxers felt they had done enough to win the fight. The bout was scored a draw, which proved to be a controversial decision. The final scores were 115–110 for Márquez, 115–110 for Pacquiao and 113–113. The judge who scored the bout 113–113 admitted to making an error on the scorecards, having scored the first round as 10–7 in favor of Pacquiao instead of the standard 10–6 for a three-knockdown round. If he had scored the round 10–6 for Pacquiao (as the other two judges did), the result would have been a split decision in favor of Pacquiao. However, ESPN reported that some pundits have also scored the fight in favor of Márquez. On September 10, 2005, Manny Pacquiao knocked out in six rounds Héctor Velázquez at Staples Center in Los Angeles to capture the WBC International Super Featherweight title, which he went on to defend five times. On the same day, his rival, Érik Morales, fought Zahir Raheem and lost via unanimous decision. Despite Morales's loss to Raheem, Pacquiao got matched up against Morales in a rematch which took place on January 21, 2006 at the Thomas and Mack Center in Las Vegas. During the fight, Morales escaped being knocked down twice, once in the second round by holding onto the ropes and once in the sixth by falling on the referee. Pacquiao eventually stopped Morales in the tenth with a TKO, the first time Morales was stopped in his boxing career. On July 2, 2006, Pacquiao defended his WBC International title against Óscar Larios, a two-time Super Bantamweight Champion who had moved up two weight divisions to fight Pacquiao. Pacquiao won the fight via unanimous decision, knocking down Larios two times in the 12-round bout at the Araneta Coliseum in Quezon City, Philippines. The three judges scored the fight 117–110, 118–108 and 120–106 all for Pacquiao. On July 3, 2006, the day after winning the fight against Larios, President Gloria Macapagal-Arroyo personally bestowed the Order of Lakandula with the rank of "Champion for Life" (Kampeon Habambuhay) and the plaque of appreciation to Pacquiao in a simple ceremony at the Presidential Study of Malacañang Palace. Pacquiao and Morales fought a third time (with the series tied 1–1) on November 18, 2006. Witnessed by a near-record crowd of 18,276, the match saw Pacquiao defeat Morales via a third-round knockout at the Thomas & Mack Center in Las Vegas. After the Pacquiao–Morales rubber match, Bob Arum, Pacquiao's main promoter, announced that Manny had returned his signing bonus back to Golden Boy Promotions, signaling intentions to stay with Top Rank. This prompted Golden Boy Promotions to sue Pacquiao over breach of contract. After a failed promotional negotiation with Marco Antonio Barrera's camp, Bob Arum chose Jorge Solís as Pacquiao's next opponent among several fighters Arum offered as replacements. The bout was held in San Antonio, Texas, on April 14, 2007. In the sixth round, an accidental headbutt occurred, giving Pacquiao a cut under his left eyebrow. The fight ended in the eighth when Pacquiao knocked Solis down twice. Solis barely beat the count after the second knockdown, causing the referee to stop the fight and award Pacquiao a knockout win. The victory raised Pacquiao's win–loss–draw record to 44–3–2 with 34 knockouts. This also marked the end of Solis's undefeated streak. On June 29, 2007, Top Rank and Golden Boy Promotions announced that they agreed to settle their lawsuit, meaning the long-awaited rematch with Marco Antonio Barrera would occur despite Pacquiao being the top-ranked contender for Juan Manuel Márquez's WBC Super Featherweight title. On October 6, 2007, Pacquiao defeated Barrera in their rematch via an easy unanimous decision. In the eleventh round, Pacquiao's punch caused a deep cut below Barrera's right eye. Barrera retaliated with an illegal punch on the break that dazed Pacquiao, but also resulted in a point deduction for Barrera. Two judges scored the bout 118–109, whereas the third scored it 115–112. In The Ring Magazine, Pacquiao (45–3–2) remained at the top of the super featherweight division (130 pounds). He had been in the ratings for 108 weeks. On November 13, 2007, he was honored by the World Boxing Council as Emeritus Champion during its 45th Annual World Convention held at the Manila Hotel. On November 20, 2007, José Nuñez, manager of WBO Super Featherweight Champion Joan Guzmán, accused Pacquiao's handler Bob Arum of evading a match between the two boxers to protect Pacquiao. Guzmán went as far as to directly call out Pacquiao at the postfight press conference of the Pacquiao–Barrera rematch in front of the crowd at the Mandalay Bay Events Center's media room in Las Vegas. On March 15, 2008, in a rematch against Juan Manuel Márquez, called "Unfinished Business," Pacquiao won via split decision. The fight was held at the Mandalay Bay Resort and Casino in Las Vegas. With the victory, Pacquiao won the WBC, The Ring and lineal super featherweight titles, making him the first Filipino and Asian to become a four-division world champion, a fighter who won world titles in four different weight divisions. The fight was a close, hard-fought battle, during which both fighters received cuts. Throughout the fight, Márquez landed the most punches at a higher percentage; however, the decisive factor proved to be a third-round knockdown, wherein Márquez was floored by a Pacquiao left hook. At the end of the fight, the judges' scores were 115–112 for Pacquiao, 115–112 for Márquez and 114–113 for Pacquiao. In the post-fight news conference, Márquez's camp called for an immediate rematch. In addition, Richard Schaefer, Golden Boy Promotions CEO, offered a $6 million guarantee to Pacquiao for a rematch. However, Pacquiao ruled out a third clash with Márquez, saying, "I don't think so. This business is over." The reason that Pacquiao did not want a rematch was because he intended to move up to the lightweight division to challenge David Díaz, the reigning WBC Lightweight title holder at that time. Díaz won a majority decision over Ramón Montano that night as an undercard of the "Unfinished Business" fight. On June 28, 2008, at the Mandalay Bay Resort and Casino in Las Vegas, Pacquiao defeated David Díaz in lightweight division via ninth-round knockout and won the WBC Lightweight title. With the victory, Pacquiao became the first and only Filipino and Asian to become a five-division world champion, a fighter who won world titles in five different weight divisions, and also became the first Filipino fighter to ever win a world title at lightweight. During the fight, which Pacquiao dominated, Díaz was cut badly on his right eye in the fourth round. After the bout, Díaz acknowledged Pacquiao's superior hand speed, stating "It was his speed. It was all his speed. I could see the punches perfectly, but he was just too fast." Bob Arum reported that the fight had made 12.5 million dollars, earning Díaz his best payday of 850,000 dollars, whilst Pacquiao earned at least 3 million dollars. Official records revealed an attendance of 8,362 (out of a maximum capacity of 12,000). Holding both the WBC Super Featherweight and Lightweight titles following the win, Pacquiao decided to vacate his super featherweight title in July 2008. On August 7, 2008, the members of the House of Representatives of the Philippines issued a House Resolution, sponsored by South Cotabato Congresswoman Darlene Antonino-Custodio, which recognized Pacquiao as a "People's Champ" — "for his achievements and in appreciation of the honor and inspiration he has been bringing... to the Filipino people." He received a plaque from the then House Speaker Prospero Nograles. On December 6, 2008, Pacquiao moved up to the welterweight division in order to face the six-division world champion Oscar De La Hoya at the MGM Grand, in a fight called "The Dream Match". Presented by Golden Boy Promotions and Top Rank, the bout was scheduled as a twelve-round, non-title fight contested at the 147-pound welterweight limit. Although Pacquiao went into the fight widely recognized as the leading pound-for-pound boxer in the world, some boxing pundits had speculated that 147 pounds could be too far above his natural weight against the larger De La Hoya. However, due to rehydration after the weigh in, De La Hoya came into the fight actually weighing less than Pacquiao and close to 20 pounds under his usual fighting weight. Pacquiao dominated the fight and, after eight rounds, De La Hoya's corner was forced to throw in the towel, awarding Pacquiao the win via technical knockout. Pacquiao was ahead on all three judges' scorecards before the stoppage, with two judges scoring the fight at 80–71 and one scoring it at 79–72. Moreover, Pacquiao landed 224 out of 585 punches, whilst De La Hoya landed only 83 out of 402 punches. After the bout, trainer Freddie Roach stated, "We knew we had him after the first round. He had no legs, he was hesitant and he was shot." The fight would be De La Hoya's last, as he announced his retirement from boxing shortly after. Pacquiao received 15 to 30 million dollars (share of the pay-per-view), plus a guaranteed amount. Tickets reportedly sold out just hours after they went on sale. Moreover, the total gate revenue for the fight was said to be nearly 17 million dollars, making it the second largest gate revenue in boxing history. On December 22, 2008, Pacquiao has been decorated with the Philippine Legion of Honor with the rank of "Officer" (Pinuno) in a ceremony marking the 73rd founding anniversary of the Armed Forces of the Philippines. As an army reservist, he was given recognition for bringing pride and honor to the country through his remarkable achievements in the ring. On May 2, 2009, Pacquiao fought at light welterweight, or super lightweight, division for the first time against Ricky Hatton at the MGM Grand Las Vegas, in a fight billed as "The Battle of the East and West." Pacquiao won the bout via knockout to claim Hatton's IBO, The Ring and lineal light welterweight titles. In doing so, Pacquiao became the second man in boxing history to become a six-division world champion, a fighter who won world titles in six different weight divisions and the first man ever to win lineal world titles in four different weight classes. The knockout won him The Ring Magazine "Knockout of the Year" for 2009. On November 14, 2009, Pacquiao defeated Miguel Cotto via technical knockout in the twelfth round at the MGM Grand Las Vegas in a fight billed as "Firepower." Although the bout was sanctioned as a world title fight in the welterweight division, where the weight limit is 147 pounds, Cotto agreed to fight at a catchweight of 145 pounds. Pacquiao dominated the fight, knocking Cotto down in round three and round four, before the referee stopped the fight at 0:55 of round twelve. With this victory, Pacquiao took the WBO Welterweight title, was awarded the WBO Super Championship title and became the first seven-division world champion, the first fighter in boxing history to win world titles in seven different weight divisions. Pacquiao also won the first and special WBC Diamond Championship belt. This belt was created as an honorary championship exclusively to award the winner of a historic fight between two high-profile boxers. After the fight, promoter Bob Arum stated "Pacquiao is the greatest boxer I've ever seen, and I've seen them all, including Ali, Hagler and Sugar Ray Leonard." Miguel Cotto said in a post fight interview: "Miguel Cotto comes to boxing to fight the biggest names, and Manny is one of the best boxers we have of all time." The fight generated 1.25 million buys and $70 million in domestic pay-per-view revenue, making it the most watched boxing event of 2009. Pacquiao earned around $22 million for his part in the fight, whilst Cotto earned around $12 million. Pacquiao–Cotto also generated a live gate of $8,847,550 from an official crowd of 15,930. On November 20, 2009, in a simple rites at the Quirino Grandstand, President Macapagal-Arroyo conferred Pacquiao the Order of Sikatuna with the rank of Datu (Grand Cross) with Gold distinction (Katangiang Ginto) which usually bestowed to foreign diplomats and heads of state. It was awarded to Pacquiao for winning his historical seventh weight division world title. Following the victory against Cotto, there was much public demand for a fight between the seven-division world champion Manny Pacquiao (the number-one pound-for-pound boxer) and the five-division world champion Floyd Mayweather Jr. (the number-two and former number-one pound-for-pound boxer). Pacquiao reportedly agreed to fight Mayweather on March 13, 2010 for a split of $50 million up front, and it was later agreed that the venue for the fight would be the MGM Grand Las Vegas. However, the bout was put in jeopardy due to disagreements about Olympic-style drug testing. The Mayweather camp wanted random blood testing by the United States Anti-Doping Agency, whereas Pacquiao refused to have any blood testing within 30 days from the fight, because he thought it would weaken him, but he was willing to have blood taken from him before the 30-day window as well as immediately after the fight. 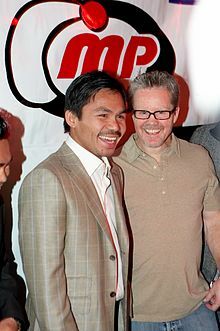 Freddie Roach, on the other hand, commented that he would not allow blood to be taken from Pacquiao one week before the fight. In an attempt to resolve their differences, the two camps went through a process of mediation before a retired judge. After the mediation process Mayweather agreed to a 14-day no blood testing window. However, Pacquiao refused and instead only agreed to a 24-day no blood testing window. Consequently, on January 7, 2010, Pacquiao's promoter Bob Arum declared that the fight was officially off. Because of Pacquiao's reluctance to submit to random blood testing to the extent requested by Mayweather, despite lack of evidence, the Mayweather camp repeated their suggestion that Pacquiao was using banned substances, which resulted in Pacquiao filing a lawsuit for defamation, seeking damages in excess of 75,000 dollars. The lawsuit cited accusations made by Floyd Mayweather Jr., Floyd Mayweather Sr., Roger Mayweather, Oscar De La Hoya and Golden Boy Promotions CEO Richard Schaefer. After negotiations for the Mayweather fight fell through, other boxers were considered to replace Mayweather as Pacquiao's next opponent, including former Light Welterweight Champion Paul Malignaggi, and WBA Light Middleweight title holder Yuri Foreman. However, Pacquiao chose to fight former IBF Welterweight title holder Joshua Clottey instead. On March 13, 2010, at the Cowboys Stadium in Arlington, Texas, Pacquiao defeated Clottey via unanimous decision to retain his WBO Welterweight title. The judges scored the fight 120–108, 119–109, and 119–109, all in favor of Pacquiao. During the fight, Pacquiao threw a total of 1231 punches (a career high), but landed just 246, as most were blocked by Clottey's tight defense. On the other hand, Clottey threw a total of 399 punches, landing 108. Manny Pacquiao was named as the Fighter of the Decade for years 2000–2009 by the Boxing Writers Association of America (BWAA). This award was presented by legendary boxer Joe Frazier, who was also a recipient of the award himself back in 1978 for defeating Muhammad Ali. Aside from this prestigious recognition, he was also named as the Sugar Ray Robinson Fighter of the Year for 2009, having received the same honor in 2006 and 2008. The awards ceremony was held at the Roosevelt Hotel in New York City on June 4, 2010. After his victory over Clottey, Pacquiao was expected to return to boxing in late 2010 with a possible matchup against Floyd Mayweather Jr.. It was later reported that Golden Boy Promotions CEO Richard Schaefer and Top Rank Chief Bob Arum worked out a "Super Fight" between Manny Pacquiao and Floyd Mayweather Jr.. However, complications arose when Mayweather requested Pacquiao undergo random blood and urine testing up until the fight day. Pacquiao responded that he would agree to undergo blood and urine testing up until 14 days before the fight (as requested by Mayweather in the first round of negotiations), stating that giving blood too close to the fight day would weaken him. On May 13, 2010, Pacquiao's promoter Bob Arum announced that he had penciled in November 13, 2010 as the date of Manny Pacquiao's next fight, possibly against Mayweather. However, the stumbling block over demands that Pacquiao submit to Olympic-level random drug testing put the fight in jeopardy. On June 12, 2010, the President of Golden Boy Promotions, Oscar De La Hoya, stated during an interview with a Spanish network that the deal for the fight was very close and the negotiation process has been very difficult. On June 30, 2010, Arum announced that the management of both sides had agreed to terms, that all points had been settled (including Pacquiao agreeing to submit to both blood and urine testing) and only the signature of Floyd Mayweather Jr. was needed to seal the deal that could have earned both fighters at least $40 million each. Mayweather was then given a two-week deadline for the fight contract to be signed. Arum also announced that Pacquiao accepted the terms of the random drug testing, blood and urine, leading up to the fight. On July 15, 2010, Bob Arum announced that Pacquiao's camp would give Mayweather until Friday midnight to sign the fight. The next day, the Top Rank website embedded a countdown clock on their website with the heading "Money" Time: Mayweather's Decision. On July 17, 2010, Arum announced that there was no word from Mayweather's camp and the deal for a November 13, 2010 fight with Mayweather was not reached. On July 19, 2010, Leonard Ellerbe, one of Floyd Mayweather Jr.'s closest advisers, denied that negotiations for a super fight between Mayweather and Pacquiao had ever taken place. Ellerbe stated that Bob Arum was not telling the truth. Bob Arum responded, questioning that if there was no negotiation, then who imposed the gag order (referring to a gag order about the negotiation allegedly imposed on both camps) and who could there be a gag order from if there were no negotiations. He also criticized Oscar De La Hoya and his Golden Boy Promotions CEO Richard Schaefer for denying that negotiations took place, when De La Hoya himself had previously stated that they were "very, very close in finalizing the contracts." Arum revealed that HBO Sports President Ross Greenburg acted as the mediator between Mayweather's handlers and those of Pacquiao's from Top Rank Promotions. On July 26, 2010, Ross Greenburg said in a statement that he has been negotiating with a representative from each side since May 2, 2010, carefully trying to put the fight together and he did in fact act as a go-between in negotiations with the two sides, but they were unable to come to an agreement, contradicting what Arum and the Pacquiao camp had said. Floyd Mayweather Jr., after the second negotiation had been officially declared off, told the Associated Press that he had fought sixty days ago and that he was not interested in rushing into anything and was not really thinking about boxing at the moment. Almost a year later, on July 8, 2011, Manny Pacquiao's top adviser Michael Koncz confirmed that Pacquiao had in fact never agreed to testing up until fight day, which contradicted what Bob Arum and the Pacquiao camp had been saying for well over a year. On July 23, 2010, Bob Arum announced that Pacquiao would fight Antonio Margarito on November 13, 2010. The fight for the vacant WBC Light Middleweight title gave Pacquiao the chance to win a world title in his eighth weight class, the light middleweight, or super welterweight, division. A catchweight of 150 pounds was established for the fight, although the weight limit for the light middleweight division is 154 pounds. During the pre-fight, Pacquiao weighed in at a low 144.6 pounds, while Margarito weighed in at the limit of 150 pounds. Pacquiao said he was pleased with his weight because he loses too much speed when he gains pounds. During the fight itself, Pacquiao weighed 148 lbs, 17 pounds lighter than Margarito's 165. Prior to the fight, Pacquiao's team demanded to the Texas officials to test Margarito for banned substances after a weight loss supplement, reportedly Hydroxycut, was found in his locker. It was stated that the officials would undergo testing for both boxers after the fight. In the fight, Pacquiao defeated Margarito via unanimous decision, using his superior handspeed and movement to win his 8th world title in as many divisions. In the penultimate round, Pacquiao implored referee Laurence Cole several times to stop the fight as Margarito had a swollen face and a large cut beneath the right eye, but the referee let the fight continue. Margarito had to be taken directly to the hospital after the fight, where it was discovered his orbital bone had been fractured; he had to undergo surgery. On November 22, 2010, after winning world title in his eighth weight division, Pacquiao was awarded with another Congressional Medal of Distinction from his fellow congressmen led by House Speaker Feliciano Belmonte during the ceremony at the Philippine House of Representatives. Because Pacquiao had no plans to defend the WBC Light Middleweight title that he won against Margarito, the WBC Board of Governors voted to declare the title vacant. On May 7, 2011, Pacquiao successfully defended his WBO Welterweight title against three-division world champion Shane Mosley via lopsided unanimous decision at the MGM Grand Arena. Rapper LL Cool J performed as Mosley first entered the arena, while vocalist Jimi Jamison of the rock band Survivor sang "Eye of the Tiger" as Pacquiao approached the ring. Pacquiao knocked Mosley down in the third round using a one-two capped with a left straight. Mosley was left dazed by the knockdown but managed to stand up. Mosley floored Pacquiao in the tenth round with a push, but referee Kenny Bayless inexplicably ruled it a knockdown. None of the judges seemed to have bought it judging from the scores. Replays showed that Pacquiao was throwing a punch off balance, had his right foot stepped on by Mosley's left foot and went down with a little help from Mosley's right hand. Bayless apologized to Pacquiao after the fight for the mistake. Pacquiao gained one-sided verdicts from all three judges (119–108, 120–108, and 120–107). Pacquiao reported that the only thing preventing him from knocking out Mosley was a cramp in his legs. Freddie Roach said that Pacquiao had problems with cramping before but usually in training sessions and not in the middle of bouts. After the fight, there was much controversy over Shane Mosley reportedly telling Floyd Mayweather that he should have made Pacquiao "take the test." Bob Arum talked about having Pacquiao's next bout at the MGM Grand on November 5, 2011 or across town at the Thomas and Mack Center on November 12, 2011. Arum listed Juan Manuel Márquez as the first choice and then mentioned Timothy Bradley and Zab Judah as other options. Pacquiao's promoter Bob Arum stated that a third meeting with Márquez could happen in November 2011, providing Pacquiao defeated his next opponent Shane Mosley on May 7. On May 10, Márquez accepted an offer from Top Rank to fight Pacquiao for his WBO Welterweight title at a catchweight of 144 pounds. On May 18, Márquez signed the deal to fight Pacquiao for the third time on November 12 at Las Vegas. On November 12, Márquez lost to Pacquiao via majority decision by garnering scores 114–114, 115–113, and 116–112 from scorecards of three judges. Upon the results being announced, the crowd reaction was largely negative with thousands continuing to boo as Pacquiao spoke with Max Kellerman. Tim Smith of New York's Daily News wrote that Márquez "was robbed of a decision by judges who were either blind or corrupt." However, ringside punch stats showed Pacquiao landing more strikes, 176 to 138, and landing more power punches, 117 to 100. Michael Woods of ESPN stated that Márquez was not robbed noting the Compubox stats, all of which favored Pacquiao. On February 5, Bob Arum announced Timothy Bradley as Pacquiao's next opponent on June 9 for his WBO Welterweight title, after another failed negotiation attempt with Floyd Mayweather, Jr. on Cinco De Mayo. During the final press conference, WBO President Francisco "Paco" Valcarcel awarded Pacquiao with WBO Diamond Ring in recognition of Pacquiao as the WBO Best Pound-for-Pound Fighter of the Decade. Pacquiao lost the bout in a controversial split decision, scoring 115–113, 113–115, and 113–115 from the three judges. The decision was booed by the crowd and criticized by many news outlets who were independently scoring the fight. However, Pacquiao was gracious in defeat and Bradley called for a rematch. Following the decision, many analysts called the decision a sign of corruption in the sport. ESPN.com scored the fight 119–109 for Pacquiao. HBO's unofficial judge, Harold Lederman, also had it 119–109 for Pacquiao. Most ringside media also scored the fight in favor of Pacquiao. Four days after the fight, Valcarcel said in a statement on June 13, 2012, that, though the WBO did not doubt the ability of the scoring judges, the WBO's Championship Committee would review the video of the fight with five independent, competent and recognized international judges and make a recommendation. On June 21, 2012, the five WBO Championship Committee judges on the review panel announced that Pacquiao should have won, with all five judges scoring the fight in Pacquiao's favor—117–111, 117–111, 118–110, 116–112, and 115–113. The WBO cannot overturn the result of the fight (only the NSAC would be able to do so), but recommended a rematch between the fighters. Pacquiao fought Juan Manuel Márquez on December 8, 2012. The fight was for the WBO's "Champion of the Decade" belt. Márquez knocked down Pacquiao in the 3rd round with a looping right hook. In round 5, Pacquiao returned the favor, knocking down Márquez. Pacquiao went on the offensive in the 6th round. While behind the scorecards and with just 1 second left in the 6th round, Márquez countered Pacquiao's jab with an overhand right, sending Pacquiao face first to the canvas, resulting in a knockout. Pacquiao, who had not been knocked out in over 13 years since his loss to Medgeon Singsurat in 1999, remained unconscious for several minutes. This was named The Ring magazine's "Fight of the Year" and "Knockout of the Year" and "International Fight of the Year" by the British website BoxRec. Márquez was also named "International Fighter of the Year" by the same publication. After 11 months away from boxing, Pacquiao returned to the ring on November 24, 2013, at The Venetian Macao Hotel & Resort's CotaiArena in Macau of the Special administrative regions in China against The Ring ranked #6 Junior Welterweight: Brandon Ríos, for the vacant WBO International welterweight title. This was Pacquiao's first fight to be held in China. Pacquiao won the match by unanimous decision. Following his victory over Rios, Pacquiao sought out and ultimately got a rematch with the WBO welterweight champion of the world: Timothy Bradley who, following his controversial win over Pacquiao in their first fight in 2012, had defended the title with a victory over Ruslan Provodnikov, followed by a close, but clear split decision verdict over Juan Manuel Márquez. The fight was eventually set for the date of April 12, 2014, at the MGM Grand Garden Arena in Las Vegas, Nevada. In a tough fight, Pacquiao came on the stronger of the two fighters throughout the later rounds of the fight to end up gaining a unanimous decision victory from the judges: 118–110, 116–112, 116–112. Pacquiao faced undefeated WBO light welterweight champion Chris Algieri in Macau on November 23, 2014, for Pacquiao's welterweight title. Pacquiao dominated the bout and scored six official knockdowns en route to a lopsided victory via unanimous decision (119–103, 119–103, and 120–102). The result was largely criticized by many of the fans and celebrities who witnessed the fight, expressing their disappointment of what had been billed as the "Fight of the Century". The verdict was that the fight did not live up to its expectations mostly on the performance of Mayweather's defense-oriented strategy, with Pacquiao essentially chasing him around the ring trying to create an action. Most individual opinions about the match were split in two. Other reporters and fellow fighters, on closer inspection of the fight, have questioned the Compubox stats and judges score cards, especially the wideness of the margins, stating that the rounds should have been scored much closer, or that Pacquiao should have won via a small edge. Manny Pacquiao said "I thought I won the fight. He's moving around. It's not easy to throw punches when he's moving around so much. It's not about size. Size doesn't matter. I fought bigger. I thought I caught him many more times than he caught me." In the post-fight interview, the Pacquiao camp claimed he fought handicapped with an injured right shoulder. Promoter Bob Arum said he suffered the injury in mid-March, describing it as "the same as the one Kobe Bryant had." Manny said: "This fight doesn't bother me too much, I did my best. I hurt my shoulder, but I didn't complain or say I was injured. This is part of the game. I didn't want to make any excuses." In the end despite the criticism the Mayweather vs Pacquiao match earned a record 4.4 million pay-per-view buys. It was revealed in September 2015 that Mayweather had used IV injections before the fight to rehydrate after the weigh in. USADA did not give an exemption until 19 days after the date of the fight and Mayweather was heavily criticized for taking saline and vitamins. The Nevada State Athletic Commission, which denied Pacquiao a painkiller for his torn rotator cuff before the fight said that it was "extremely disappointed" with both Mayweather and USADA. Pacquiao's camp voiced their displeasure after the revelation. Pacquiao's promoter Bob Arum stated that "USADA has a lot of explaining to do. When we learned about this I was outraged. But I can't just bay at the moon. What legal redress do we have? I have the information, our lawyers got it, but what were we supposed to do with it? Ask for the decision to be reversed? I really think people have to look closely at USADA and investigate what's going on with them." Michael Koncz, Pacquiao's adviser stated "I find it ironic. We tried to get an injection that was totally legal before the fight and the commission slams us and then this thing with Mayweather happens." "I really blame an organization that I know that you have no love for, for really causing the problem with that fight - and that is USADA," Arum stated. "Because as a condition for doing that fight, the Mayweather people made us use USADA. And when Manny hurt his shoulder... Manny had for many years a torn rotator cuff. That's not as dangerous as you think. A lot of major league pitchers have pitched with a torn rotator cuff. Manny's [injury] was about 50%, so in training he hurt it, so we immediately sent him to a big orthopedist. He does the Dodgers, the Clippers. And he and his staff, they have a protocol, and everything was checked in with USADA. "And then the doctor said that they wanted, about three hours before the fight, to shoot something into the injury - in case it goes a little bad you don't feel it and its perfectly permissible. And we went to USADA and they absolutely agreed, and they signed off, and we were told that they were going to inform the Nevada State Athletic Commission. "So the night of the fight, the doctor is in the dressing room and he's getting ready to shoot Manny's shoulder. The inspector is in there, for the commission, and we find out that the USADA people did not inform the Nevada Athletic Commission that they had approved this shot. "So Manny went into the fight without taking that shot. USADA said they forgot. And then we find out later, that after the weighin.... the USADA people went back to where Mayweather was, just as they went back to where Pacquiao was, and they were giving Mayweather a shot, which is prohibited under WADA/USADA law, to rehydrate him and he needed no rehydrating. People say that shot is used to hide the use of performance enhancing drugs. They then gave him, three weeks after the fight, a TUE [Therapeutic Use Exemption]. "People say, why would USADA do such a thing? Well, we use an organization called VADA, which is approved by the Nevada Commission and they charge us. They are used for every fight, and they charge us $20,000 for the testing. Do you know what USADA charges? $100,000 to $150,000. And who pays that in boxing? Only Mayweather." Top Rank promoter Bob Arum said Pacquiao's next opponents were to be either Terence Crawford, Lucas Matthysse, or Kell Brook. There was also speculation that Amir Khan would another possible foe. Boxing fans were surprised when Manny Pacquiao and his camp chose to challenge Timothy Bradley Jr. in a rubber match on April 9, 2016 at the MGM Grand in Las Vegas for the WBO International welterweight title. According to Pacquiao this will be his last fight as a professional. On February 22, Philippine senatorial candidate Walden Bello asked the Commission of Elections (COMELEC) to cancel the Pacquiao's fight against Bradley, because it will give the boxer-politician free publicity, violating the Republic Act 9006 or the Fair Elections Act. The fight will fall in the 90-day national candidates campaign period for the national elections. Arum said in an interview that the fight's cancellation is not yet an option and stated that there is no conflict-of-interest between the fight and Pacquiao's senatorial campaign. Prior of this bout, Pacquiao and Bradley were regarded as the two most accomplished and best welterweights in the world by TBRB, BoxingScene and ESPN and two top 5 best pound-for-pound fighters. Pacquiao won the match via unanimous decision to capture the vacant WBO International and lineal welterweight titles. This makes him the only fighter in history to win lineal championships in five different weight classes. In addition, Pacquiao becomes the only third fighter in boxing history to win three lineal crowns in the divisions alternatively referred to as the original, major, or glamour divisions (flyweight, featherweight and welterweight) joining the exclusive club of Bob Fitzsimmons and Henry Armstrong who have won a legitimate world championship in three of the original eight weight divisions. After the match, Pacquiao said, "As of now, I am retired", and later shared "I'm going to go home and think about it. I want to be with my family. I want to serve the people." On June 23, 2016 it was reported that Pacquiao would return to boxing ring later that year after a brief retirement. In an interview with BoxingScene website, Top Rank president Bob Arum said: "Well we gotta see. If he will fight this year, then he will fight next year. We are thinking about him fighting in October if he wants to fight. Once I get the opponent that I am working on - we are working on opponents and once I get that, I will fly over to the Philippines and he will see if his schedule in the senate allows him to train for a fight and participate in a fight. I know he wants to continue fighting but the impediment is how labor intensive his work as a Filipino senator is and he is not going to really know that for another week or so. He was just sworn in as a senator yesterday," According to Yahoo! Sports, Arum reserved Mandalay Bay for October 15, just in case Pacquiao decides to continue fighting in the ring. Arum said: "I'm not sure Manny is going to return, but I believe he wants to return. The question is, can he return and yet fulfill his duties as a senator in the Philippines? I don't think even he knows that answer yet, because he's just taken office." According to BoxingScene report, Arum said that Pacquiao has even brought up with the Senate leadership the possibility of taking a leave of absence to train for a fight: "He is going to fight. I don't know what the date is. He is working with the president of the Philippines Senate for an appropriate date where he can leave the Philippines for two or three weeks to prepare for the fight." There were also reports that a fight between Pacquiao and former four-division world champion Adrien Broner was being negotiated, something embraced by Pacquiao's longtime trainer Freddie Roach. But Arum, for his part, said Broner priced himself out of the fight: "That is correct (that Broner priced himself out). I was dealing with (Broner's adviser) Al Haymon on making that fight. Al tried but Broner was asking for crazy money that nobody can afford so he is out and Manny is looking for another opponent." Arum told in an interview. Other leading candidates for Pacquiao's comeback are WBO welterweight champion Jessie Vargas, WBC welterweight champion Danny García and the winner of July 23 jr. welterweight title unification bout between WBO jr. welterweight champion Terence Crawford and WBC super lightweight champion Viktor Postol. "There is no truth to media reports that I'm planning to take a leave from my senate duties just to fight again atop the ring. I want to make it clear - my priority is my legislative works. My next fight has not yet been discussed. Should there be any, I'll make sure it will not interfere with my senate duties. When I ran for senator last May 9 elections, I made a promise to be present in all sessions. I owe it to the people. If ever I decide to fight again, rest assured, it will happen when congress is on recess so there's no need for me to go on leave. The entire training will be done in the Philippines to ensure I can attend sessions even while on training camp. Boxing is my only means of livelihood to support my family and to help those who are in need. Politics, to me, is a vocation not a means to eke out a living. I want to maintain that belief. I want to keep my dignity intact while in public service. May God continue to guide and bless all our endeavors." On July 11, Arum said that Pacquiao will return to the ring sometime in the fall, likely either on October 29 or November 5, in the main event of a pay-per-view card staged in Las Vegas and televised by HBO. Arum said in an interview: "He now has given us the go-ahead to shop for a venue and an opponent and see if we can do it on a particular date or dates. We've been trying to work out a date that doesn't interfere with his senatorial responsibilities and his ability to train." And on July 18, Arum confirmed that Pacquiao is set to fight on November 5 at the Thomas & Mack Center in Las Vegas, Nevada. Senate President Franklin Drilon expressed his support for Pacquiao's reported plan to go back to boxing, confirming for the first time that the newly elected senator had sought his permission to fight again. Pacquiao adviser Michael Koncz said in a report that the southpaw, while committed to politics, is happiest when he is in the ring: "Manny's primary concern and obligation is to fulfill his senatorial duties. But he just misses boxing. He misses the training. He misses being in the gym. You can see when he trains it's like a stress reliever for him. His mood changes. It's like he's in happy land. So I am working with Bob and Manny is working closely with the senate president to make sure the dates are okay. We're doing this properly." On August 3, Pacquiao's business manager confirmed that WBO welterweight champion Jessie Vargas (27-1, 10 KOs) will be the next opponent for Pacquiao on November 5, at the Thomas & Mack Center in Las Vegas, Nevada. Pacquiao made the confirmation after a two-hour meeting with Top Rank's Bob Arum and Canadian adviser Michael Koncz held in Manila on August 7, that he agreed to fight Vargas. "Yes, the fight is on. I have agreed to a Nov. 5 fight with reigning WBO welterweight champion Jessie Vargas. Boxing is my passion. I miss what I'd been doing inside the gym and atop the ring. My entire training camp will be held here in the Philippines so I can attend to my legislative works. This is my campaign promise and I'm determined to keep it," Pacquiao said in a statement. He also explained that he has to fight again to earn a living: "Boxing is my main source of income. I can't rely on my salary as public official. I'm helping the family of my wife and my own family, as well. Many people also come to me to ask for help and I just couldn't ignore them." On August 11, it was revealed by Bob Arum that the fight will not be distributed by HBO PPV despite a contract with Pacquiao. HBO reportedly declined to carry the fight because they are already committed to hosting the anticipated November 19 fight between unified light heavyweight champion Sergey Kovalev and former lineal super middleweight champion Andre Ward and certainly the network couldn't handle two PPVs in one month and would prefer for Pacquiao to fight on October 29, along with the Tyson Fury vs. Wladimir Klitschko heavyweight championship match instead. But Arum said Pacquiao has to fight around his Philippine Senate schedule which effectively makes other fight dates impossible. Arum reiterated that if HBO will not produce or distribute the PPV, it will invalidate Pacquiao's contract with the network and make him a free agent: "In my opinion, they have an obligation to distribute this fight. The fact that they passed means the contract is over, it seems clear to me. They can't pick and choose which fights they are going to distribute. They're either in breach of contract or they've ended the contract. My feeling is, based my legal background, is that the contract is terminated." HBO, on the other hand, believed that their existing contract with Pacquiao still stands, although they would not publicly comment on the disagreement otherwise. Arum said that HBO has no right to object to the date since he's putting up the money as the promoter while the network bears no risk. He also claims that their contract with the network clearly states that only Pacquiao's opponent has to be mutually agreed upon by both sides, not the date. HBO has televised nearly all of Pacquiao's major fights including 21 pay-per-views since 2003. According to Arum, possible distributor of the fight include cable giants Turner Broadcasting System, ESPN and HBO's rival network Showtime. In a press conference on September 8 held in Los Angeles California, it was announced by Bob Arum that the fight will be self-distributed by Top Rank PPV. He also revealed that his company will continue to produce and distribute future pay-per-view events without the involvement of HBO. As for the commentating panel, Arum stressed that he plans to put a star-studded announcing team, which will rival the work of HBO's Jim Lampley and Max Kellerman. Arum confided that he is in talks with major boxing analysts, but he declined to name one as he has not worked out any official deals yet. "I think the commentating team is going to blow everybody's socks off," he vowed. According to Arum, Top Rank's initial plans have received a good feedback from its partners and television companies, which gives him a hindsight that they could pull it off. "They're all very, very receptive to getting this kind of programming. But right now, this looks like the most likely scenario," Arum stated. On September 26, Top Rank unveiled the broadcast team for the Nov. 5 PPV bout featuring sports commentating stars Stephen A. Smith of ESPN, Brian Kenny of MLB Network, Charissa Thompson of Fox Sports and former two-division and five-time world champion Timothy Bradley as the ringside commentating team for the fight. The pay-per-view telecast would also feature WBO jr. featherweight champion Nonito Donaire and WBO featherweight champion Óscar Valdez. This marks the first time Pacquiao and Donaire, the two biggest boxing stars to come out of the Philippines, have ever shared the same card. Floyd Mayweather Jr. made an entrance and sat ringside with his daughter before the main event began. When asked why he was at the fight, he replied, "I'm just taking her to the fight. ", whilst pointing to his daughter. In front of 16,132 in attendance, Pacquiao defeated Vargas in a lopsided unanimous decision to win the WBO welterweight title for the third time. In the second round, Pacquiao caught Vargas with a straight left counter, dropping him to the canvas. In the eighth round, an accidental clash of heads opened a deep cut on Vargas’ right eyebrow. However, replays between rounds clearly showed that the cut above Vargas’ eye in the eighth was caused by a left straight punch, which the Nevada Athletic Commission has ruled. In the eleventh round, Vargas went down on a slip, tripping over his feet after he got hit by a right. Vargas went down again in the twelfth round, but Kenny Bayless ruled it another slip. Pacquiao won on all three ringside scorecards—118–109, 118–109 and 114–113. According to Compubox statistics, Pacquiao landed 147 of 409 of his punches (36%), and Vargas landed 104 of 562 of his punches thrown (19%). Pacquiao was guaranteed $4 million plus a percentage of the revenue of the fight while Vargas was guaranteed $2.5 million. On February 26, 2017, both Pacquiao and Amir Khan announced on Twitter that they would face each other on April 23 in a "super fight". The UAE, specifically Abu Dhabi, were front runners to host the fight worth potentially £30 million, with the United States and the UK also being possibilities. Pacquiao was initially in negotiations to fight Jeff Horn in Australia, but held a poll asking the fans who he should fight next. Khan won the poll, thus setting up the fight. The Sevens Stadium in Dubai, Zayed Sports City Stadium and Mohammed Bin Zayed Stadium in Abu Dhabi were being considered as the venue. Speaking to Bob Arum on March 1, Pacquiao's adviser Michael Koncz confirmed the fight would take place on May 19 in the United States which means it would be a Friday night PPV and May 20 in the Middle-East. In the early morning of March 2, Bob Arum stated that the date of the fight was not close to being set with Khan's representatives. Later that day, Khan's camp confirmed they had agreed the revised fight date. Bob Arum told ESPN on 8 March that there was never a deal in place for the fight to take place, "It's kaddish for the UAE deal. It's dead." Arum also mentioned that if there was any chance the fight can take place, it would be in the second half of 2017 and that Khan would not be Pacquiao's next opponent. Arum, on March 27 told the International Business Times that Pacquiao vs. Horn was back on. A likely date of July 2, 2017 was discussed. On April 1, it was confirmed that Horn had signed the contract at his end and was waiting for Pacquiao, who was believed to have received the contract. He and his team were going over the terms. “We have to get the contract signed. They’re reviewing the contract and hopefully it will be signed in the next hours or so. On the Australian side, everything is done. Jeff Horn has signed the contract,” Arum told The Star. Arum later stated that there was no deadline for an agreement to be reached before declaring 'everything is done'. It was reported by Manila Times on April 7 that Pacquiao had signed for the fight to take place at Suncorp Stadium in Brisbane, Australia. It was noted that he would start training in the first week of May. Around 55,000 fans around the world were expected to be in attendance and the event would pump at least $24 million into the local economy. On April 10, Carl Moretti told ESPN the fight was close to being finalized. Bob Arum officially announced the fight on April 10, billed as "The Battle of Brisbane". On June 1, it was reported that 40,000 tickets had been sold within over a month left for the fight. On June 19, 2017, it was announced that ESPN and Top Rank finalized a deal that would air the bout live on ESPN. This marked the first time that a Pacquiao fight would not be on pay-per-view since his co-main event fight with Hector Velasquez in an Erik Morales-Zahir Raheem headliner on September 10, 2005. In front of 51,052, Pacquiao lost a hard fought fight via a controversial unanimous decision when the three judges scored it 117–111, 115–113, 115–113 in favor of Horn. Many pundits, current and former boxers believed Pacquiao had done enough to retain the WBO title. Although Horn was the aggressor and showed determination throughout the fight, it nearly came to an end in round 9 when Pacquiao took control and looked for the stoppage. Horn survived the round and was told by referee Mark Nelson, that he needs to show competitiveness or he would stop the fight. Despite now having lost four of his last nine fights, Pacquiao remained humble, “I’m professional. I respect the judges.” It was reported that Horn would receive $500,000 from this fight and Pacquiao was guaranteed at least $10 million. Pacquiao stated he would activate the rematch clause and fight Horn again at the end of 2017. Compubox stats showed that Pacquiao landed 182 out of 573 punches thrown (32%), whilst Horn landed 92 of 625 thrown (15%). Post-fight stats showed that Pacquiao landed almost double the number of punches that Horn landed. Dieter Kurtenbach of Fox Sports described the fight as "rigged", and T. J. Quinn of ESPN commented, “No way in hell Horn won unanimously,” he tweeted. “A 117–111 card? Ridiculous. This is a hometown hit job. Manny looked old, but mostly in control". In regards to the controversial scorecards, ESPN's Dan Rafael scored the fight 117–111 and ESPN analyst Teddy Atlas scored it 116–111, both for Pacquiao. The Guardian and IBT also scored the fight in favor of Pacquiao as well, 117–111. BoxingScene had it 116–112 for Pacquiao, while CBS Sports scored the fight 114–114 even. BoxNation's Steve Bunce scored the fight 115–113 for Horn. In total, 12 of 15 media outlets scored the bout for Pacquiao, 2 of 15 outlets ruled in favor of Horn, and 1 scored a draw. In total, 12 of 15 media outlets scored the bout for Pacquiao, 2 of 15 outlets ruled in favor of Horn, and 1 scored a draw. On July 6, 2017, the WBO announced that it would re-score the Manny Pacquiao vs. Jeff Horn fight but the result would still stand. The WBO rescored the fight 7 rounds to 5 in favour of Horn. Top Rank CEO Bob Arum said the result of the WBO's review "doesn't settle anything." Arum stated: "First of all they didn't [rule] that Jeff Horn clearly won the fight. They (WBO) had five judges scoring the fight: three had Horn winning narrowly, one had it a draw, one had Pacquiao winning." Pacquiao was 'not surprised' with the re-score and vowed to fight on and continue his professional boxing career. On January 16, 2018 it was first reported that Pacquiao would return to the ring on the undercard of Terence Crawford vs. Jeff Horn for the WBO welterweight championship on April 21. Arum wanted the card to take place at the T-Mobile Arena in Las Vegas and have the card take place on ESPN PPV. Early rumours indicated he would fight 37 year old former WBO light welterweight champion Mike Alvarado (38-4, 26 KOs). On February 2, after winning the vacant WBA (Regular) welterweight title against Tewa Kiram, Lucas Matthysse (39-4, 36 KOs) stated he was interested in fighting Pacquiao next. Freddie Roach as well as Golden Boy Promotions Eric Gomez liked the idea of the fight happening. Arum was also open to fight taking place, but stated it wouldn't happen next as he was likely to match Pacquiao with Alvarado. On March 1, Pacquiao withdrew from the Crawford-Horn card. According to Aquiles Zonio, Pacquiao's media relations officer, Pacquiao felt it was insult to have him in a non-main event roll and felt he was the obvious ticket seller for the card, also believing he beat Horn in their fight in 2017. In an interview, Pacquiao told ABS-CBN television he would fight in Malaysia, where he has a group willing to put up the necessary funds, in May or June 2018. It was said that Pacquiao's MP Promotions would promote the event with a confirmed date of June 24. Arum played down the talks and said the fight had not been finalized. Pacquiao started training for the potential bout on March 12. Although the fight wasn't officially announced, the date was pushed back to July 8. Pacquiao explained the reason the date had changed was because June 24 would have fallen 10 days after the Islamic month, Ramadan and more than 60% of Malaysia's population are Muslim. On April 2, the fight was officially confirmed for July 14, US time in Kuala Lumpur, Malaysia. Pacquiao would go into the fight without long-time trainer Freddie Roach and instead be trained by his life-long friend Buboy Fernandez, who had served as an assistant trainer in previous fights. It would mark the first time in 34 fights, since 2001 that Roach would not be in Pacquiao's corner. It was noted that Top Rank would deal with the television distribution of the fight in the United States with the fight taking place on ESPN+, at the time, ESPN's new monthly subscription streaming service. In order for the fight to take place during primetime hours in the United States due to the time difference, the bout would take place on Sunday morning, July 15 in Malaysia. On April 13, it was officially rumored that Pacquiao had parted ways with Roach. However, on April 15, Pacquiao had wrote to social media that he had not decided on who will coach for the bout against Matthysse. On May 18, according to sources in Argentina, the fight was in jeopardy and likely to be postponed. A day later however, Pacquiao denied the reports and called the rumours "malicious and untrue." By July 1, there was still doubts about the fight taking place, notably from Bob Arum. Pacquiao however, told Philboxing.com the preparations were in the final stages and the funds would be released to Golden Boy in the coming days. On July 2, Golden Boy and Matthysse confirmed receipt of funds and proposed to fly out to Malaysia the next day. The fight took place at the Axiata Arena. Pacquiao scored his first knockout in nine years by stopping Matthysse in round 7 to win the WBA (Regular) welterweight title. Pacquiao dropped Matthysse a total of 3 times before the fight was stopped. The knockdowns occurred in rounds 3, 5 and 7. In round 5, Matthysse took a knee. The final knockdown was from a left hook following a combination. Referee Kenny Bayless began the count, stopping the fight at 2 minutes and 43 seconds after Matthysse spat out his mouthpiece. At the time of the stoppage, all three judges had the bout 59–53 in favor of Pacquiao. Speaking about the game plan, Pacquiao said, "Matthysse has the power, so hands up all the time and do my best. I'm surprised because Matthysse is a very tough opponent and I knocked him down. I was focused and patient in the fight, and I worked hard in training. We did a good job in training. We were pushing hard." Matthysse had no excuses, stating he lost to "a great fighter and a great champion." At the post-fight press conference, Pacquiao confirmed he would continue boxing. According to Compubox, Pacquiao landed 95 of 344 punches thrown (28%), this included a 44% connect rate on his power punches. Matthysse landed 57 of his 246 thrown (23%), only landing in double figures in round 6. On August 2, Matthysse announced his retirement from professional boxing at the age of 35. After Manny Pacquiao signed with Al Haymon in October 2018, reports circulated that Adrien Broner was the front-runner to face him in January 2019. On October 18, 2018 Pacquiao confirmed that the deal was almost complete. On November 19, 2018 a press conference was held in New York City to confirm the fight between Pacquiao and Broner on January 19, 2019 for the WBA (Regular) welterweight title. Pacquiao reunited with long time trainer Freddie Roach who supervised the whole training camp while Buboy Fernandez did the mitts and physical parts of the training due to Pacquiao's concern of Roach's health. The fight took place at the MGM Grand Garden Arena in Las Vegas, Nevada and was distributed by Showtime PPV. Pacquiao successfully defended his WBA (Regular) welterweight title against Broner via unanimous decision and never seemed troubled throughout the fight. In the seventh round, Pacquiao trapped Broner to the ropes as he unloaded a barrage of punches that prompted Broner to tie him up to halt the attacks. Pacquiao then continued his onslaught after the break, but Broner survived the round nonetheless. In the ninth round, Pacquiao caught Broner with a huge left hand that sent Broner reeling backwards. All three judges ruled in favor of Pacquiao 117–111, 116–112, 116–112. According to CompuBox, Pacquiao landed 82 out of 197 of his power punches (42%) against Broner's 39 out of 180 power punches (22%). Total punch stats were 112 out of 568 (20%) for Pacquiao and 50 out of 295 (17%) for Broner. This marked Broner's career low for total punches landed at 50, his previous low was 90 against Jessie Vargas. During the post fight interview, Jim Gray asked Pacquiao if a Floyd Mayweather Jr. rematch will happen and Pacquiao answered, "Tell him to come back to the ring, and we will fight." Mayweather, who was ringside, was asked by Gray to nod at the camera if he wanted a rematch with Pacquiao but Mayweather did not give an answer. The fight sold 400,000 pay-per-view buys in the United States, earning an estimated $30 million in pay-per-view revenue. The bout produced a live gate of $6 million from 11,410 tickets sold. The final attendance was reported to be 13,025. The following fights were broadcast on pay-per-view television. The following fight was telecast at American closed-circuit theatre TV venues. ^ a b ESPN tale of the tape prior to the Lucas Matthysse fight. ^ "Pacquiao gets record 12th world title in 8 weight divisions". INQUIRER.NET. July 16, 2018. ^ "Pacquiao Rebounds, Decisions Bradley". Queensberry Rules. Retrieved May 2, 2016. ^ Jake Donovan. "Manny Pacquiao's Return Is For The Love Of The Game". Boxing Scene. ^ "Ranking Manny Pacquiao's eight division titles". ESPN. Retrieved May 3, 2016. ^ "Poverty gave Pacquiao his big push". China Daily. 15 August 2017. ^ Jake Emen. "Weight Divisions History & Guide". ProBoxing-Fans. Retrieved July 6, 2016. ^ "#P4Prank: No. 2 of past 25 years". ESPN. April 8, 2016. ^ "Ring Ratings Pound for Pound December 5, 2014". Archived from the original on December 8, 2014. Retrieved 2014-11-29. ^ The World's Highest-Paid Athletes. Forbes.com (2013–06). Retrieved on February 22, 2014. 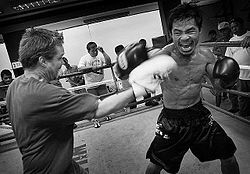 ^ "Manny Pacquiao – Bio (under Amateur, Personal Background section)". Toprank.com. Archived from the original on May 11, 2011. Retrieved May 9, 2011. ^ "GMANews.tv, After 'bittersweet' victory, Pacman rules violent sport". Gmanews.tv. November 16, 2009. Retrieved May 9, 2011. ^ "Manny Pacquiao: A Man of the People". Philboxing.com. September 23, 2010. Retrieved May 9, 2011. ^ Nigel Collins (August 29, 2016). "LONG READ: Understanding the Manny Pacquiao Phenomenon". Boxing News Online. Retrieved September 21, 2016. ^ Rivers, Jeff (July 23, 2008). "Manny Pacquiao: Conquering the Boxing World". The Scores Report. Retrieved September 26, 2008. ^ Anson Wainwright (November 19, 2009). "Three Ages of Pacquiao". 15Rounds.com. Retrieved May 17, 2010. ^ "The Lineal Flyweight Boxing Champions". The Cyber Boxing Zone Encyclopedia. ^ "The Lineal Featherweight Champions". The Cyber Boxing Zone Encyclopedia. ^ Lagumbay, Salven L. (June 19, 2005). "Pacquiao relinquishes Ring Magazine title". PhilBoxing.com. Retrieved January 11, 2009. ^ "Pacquiao gets Presidential Medal of Merit and P1 million check from GMA". Presidential Communications Operations Office. November 24, 2003. Retrieved November 22, 2010. ^ "Pacquiao receives award from House". Manila Bulletin. November 26, 2003. Archived from the original on May 28, 2013. Retrieved November 22, 2010. ^ a b c "reviewjournal.com, Márquez, Pacquiao brawl to draw". Reviewjournal.com. May 9, 2004. Retrieved May 9, 2011. ^ "Experts' scoring: Pacquiao-Marquez". ESPN. December 6, 2012. ^ "Manny Pacquiao vs. Erik Morales (1st meeting) –". Boxrec.com. Retrieved May 9, 2011. ^ "Manny Pacquiao vs Erik Morales 2". Boxstat.co. Retrieved 7 May 2017. ^ "Erik Morales Boxing Record". Boxstat.co. Retrieved 7 May 2017. ^ "Manny: This is all for you". Philippine Daily Inquirer. July 3, 2006. Archived from the original on March 9, 2007. ^ "Pacquiao destroys Morales!". Fightnews.com. November 19, 2006. Archived from the original on July 3, 2007. Retrieved September 4, 2007. ^ Danseco, Rey. "Golden Boy to sue PacMan; Filipino ring idol No. 2 pound-for-pound". ABS-CBN Interactive. Archived from the original on March 30, 2007. Retrieved September 4, 2007. ^ "sports.yahoo.com, Pacquiao rolls past Barrera in rematch". Sports.yahoo.com. May 4, 2011. Retrieved May 9, 2011. ^ "Ratings and championship policy". The Bible of Boxing. The Ring. Archived from the original on August 8, 2007. Retrieved September 4, 2007. ^ "Donaire, Condes make it to Ring Magazine ratings". GMANews.TV. July 13, 2007. Retrieved September 4, 2007. ^ Reyes, Marc Anthony (November 13, 2007). "WBC honors Pacquiao as 'Champ Emeritus'". Philippine Daily Inquirer. Archived from the original on January 25, 2008. Retrieved November 13, 2007. ^ "Guzman beats Soto, wants Pacquiao next". Philippine Daily Inquirer. November 19, 2007. Archived from the original on June 21, 2008. Retrieved January 11, 2009. ^ a b c d e "Pacquiao wins epic Marquez clash". BBC Sport. March 16, 2008. ^ "Pacman offered $6-M for Márquez rematch". Manila Mail. March 30, 2008. Archived from the original on August 3, 2012. ^ a b Rafael, Dan (June 29, 2008). "All hail the new king". ESPN. ^ "Pacquiao solidifies position as Pound-for-Pound #1". Eastsideboxing.com. June 29, 2008. Retrieved August 10, 2011. ^ Natividad, Ivan (July 2, 2008). "Manny Pacquiao WBC Lightweight Title Coverage". AsianWeek. Archived from the original on September 29, 2008. ^ "Pacquiao KOs Diaz in ninth, wins WBC lightweight crown". USA Today. June 29, 2008. ^ "Pacquiao-Diaz: Post Fight Press Conference". Secondsout.com. June 29, 2008. Retrieved August 10, 2011. ^ "Pacquiao declared 'people's champ,' envoy to Games". Inquirer.net. August 7, 2008. Archived from the original on July 30, 2013. ^ McGuigan, Barry (August 30, 2008). "This little and large freak show makes me feel queasy". Daily Mirror. ^ "Pacquiao TKOs De La Hoya". Philippine Daily Inquirer. December 7, 2008. Archived from the original on July 30, 2013. ^ a b "Pacquiao dominated match with De La Hoya". Philippine Daily Inquirer. December 7, 2008. Archived from the original on July 23, 2013. ^ "De La Hoya fails to answer bell in welterweight match". Daily Mail. December 7, 2008. Archived from the original on December 10, 2008. ^ "Oscar De La Hoya announces retirement from boxing". Sports.espn.go.com. April 15, 2009. Retrieved August 10, 2011. ^ "Longest training for Pacquiao's 'greatest fight'". Philippine Daily Inquirer. August 30, 2008. Archived from the original on July 23, 2013. ^ "Sales from De La Hoya-Pacquiao produce boxing's second-biggest gate". Sports.espn.go.com. September 24, 2008. Retrieved August 10, 2011. ^ "Pacquiao Decorated with Legion of Honor". Inside Sports. December 22, 2008. Archived from the original on July 9, 2012. ^ Rold, Cliff (May 4, 2009). "Pacquiao GETS Four (and Six): Real History in Our Time". BoxingScene.com. Retrieved May 17, 2010. ^ Davies, Gareth (January 21, 2009). "Manny Pacquiao and Ricky Hatton superfight 'off' as Filipino refuses deal". The Daily Telegraph. London. ^ "HBO bests Showtime in bid for bout". Sports.espn.go.com. February 9, 2009. Retrieved August 10, 2011. ^ Natividad, Ivan (May 2, 2009). "Pacquiao Vs Hatton by the Round Coverage". AsianWeek. Archived from the original on July 29, 2009. 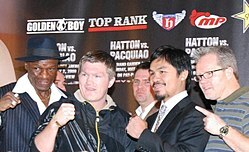 ^ "Pacquiao Knocks Out Hatton in Title Bout". The New York Times. Associated Press. May 3, 2009. Retrieved November 16, 2009. ^ "Pacquiao-Cotto duel whets fight fans' appetite for action". GMANews.TV. July 22, 2009. ^ Willis, George (November 15, 2009). "Pacquiao bloodies Cotto to affirm dominance". New York Post. ^ David Dizon (November 15, 2009). "Pacquiao wins 7th world title". ABS-CBN News and Current Affairs. Retrieved March 15, 2010. ^ Leprozo, Dave (November 18, 2009). "Pacquiao win inspires Baguio City's young boxers". GMANews.TV. ^ "WBC Diamond Belt Presentation". Fightnews. Retrieved September 8, 2009. ^ Davies, Gareth (November 16, 2009). "Manny Pacquiao fight would be easy, says Floyd Mayweather". The Daily Telegraph. London. ^ a b c "Pacquiao-Cotto tops Mayweather in PPV". Sports.espn.go.com. November 20, 2009. Retrieved August 10, 2011. ^ Mitchell, Kevin (December 4, 2009). "Manny Pacquiao lines up $50m feast of a fight with Floyd Mayweather". The Guardian. London. ^ "GMANews.TV, Bob Arum calls Pacquiao-Mayweather fight dead". Archived from the original on August 4, 2012. Retrieved 2009-12-25. CS1 maint: BOT: original-url status unknown (link). Gmanews.tv (December 25, 2009). Retrieved on May 19, 2012. ^ "Pacquiao firm on 30-day blood test limit". Philippine Daily Inquirer. December 27, 2009. Archived from the original on February 5, 2015. ^ "Mayweather, Pacquiao camps argue drug-testing points". Los Angeles Times. December 22, 2009. ^ Velin, Bob (January 1, 2010). "Mayweather blames Pacquiao for failure to work out deal". USA Today. ^ Rafael, Dan (January 1, 2010). "Arum: 'The fight's off'". ESPN. ^ a b "Pacquiao sues Mayweather for defamation". Yahoo! News. December 30, 2009. Archived from the original on January 3, 2010. ^ "Manny Pacquiao issues Floyd Mayweather Jr with lawsuit". BBC Sport. December 31, 2009. ^ Iole, Kevin (July 25, 2011). "Pacquiao-Malignaggi match could stop superfight". Sports.yahoo.com. Retrieved August 10, 2011. ^ "Pacquiao could face Yuri Foreman next". Boxingnews24.com. Retrieved August 10, 2011. ^ "Pacquiao scores unanimous decision over Clottey". abs-cbnNEWS.com. March 14, 2010. ^ "Manny Pacquiao vs. Joshua Clottey – CompuBox Punch Stats". BoxingScene.com. March 13, 2010. ^ a b King, Bill (June 14, 2010). "Boxing's grand stage". SportsBusinessJournal.com. ^ Watkins, Calvin (March 13, 2010). "Crowd is one of biggest for indoor fight". ESPN.com. ^ "Modest PPV buys for Pacquiao-Clottey bout". GMANews.TV. March 24, 2010. ^ Anderson, David (May 13, 2010). "Floyd Mayweather v Manny Pacquiao back on – for November 13". Daily Mirror. London. Retrieved May 19, 2012. ^ kaha? says: (June 12, 2010). "Golden Boy Confirms Mega Fight Close To A Done Deal". Sportslivestreams.com. Archived from the original on July 16, 2011. Retrieved August 10, 2011. ^ "Arum says Mayweather-Pacquiao have agreed to terms". Boxingnews24.com. Retrieved August 10, 2011. ^ "Manny Pacquiao agreed to drug testing all the way to the fight". Boxingnews24.com. Retrieved August 10, 2011. ^ "Pacquiao's promoter starts "Countdown Clock" for Mayweather". Latimesblogs.latimes.com. July 15, 2010. Retrieved August 10, 2011. ^ Davies, Gareth A (July 20, 2010). "Floyd Mayweather Jr denies involvement in talks over super-fight with Manny Pacquiao". The Daily Telegraph. London. Retrieved August 10, 2011. ^ Nathanielsz, Ronnie (May 4, 2009). "Bob Arum Blast Schaefer, Talk Pacquiao vs Margarito". BoxingScene.com. Retrieved July 27, 2010. ^ "Mayweather adviser denies Pacquiao deal". Sports.inquirer.net. July 21, 2010. Archived from the original on July 23, 2010. Retrieved August 10, 2011. ^ "HBO's Greenburg says there WERE negotiations". The Ring. July 26, 2010. Archived from the original on July 28, 2010. ^ "Mayweather exposed as chicken". Yahoo! Sports. July 27, 2010. ^ DAVE SKRETTA (July 25, 2011). "Mayweather silent on status of Pacquiao talks". Sports.yahoo.com. Retrieved August 10, 2011. ^ "Mayweather should keep dodging Pacquiao". Yahoo News. November 14, 2010. ^ "Controversy brews over supplement". Associated Press. November 14, 2010. Retrieved November 15, 2010. ^ "Manny Pacquiao unanimous winner". Associated Press. November 14, 2010. Retrieved November 15, 2010. ^ "Pacquiao formally receives Congressional medal of distinction". U.S. News Las Vegas. November 22, 2010. Retrieved May 28, 2011. ^ "WBC 154lb title now vacant". Fightnews.com. February 8, 2011. Archived from the original on February 11, 2011. Retrieved February 8, 2011. ^ "Pacquiao easily beats Mosley to retain WBO title". Reuters.com. May 8, 2011. Retrieved May 8, 2011. ^ "Pacquiao beats Mosley to retain WBO crown". Inquirer.net. May 8, 2011. Archived from the original on May 12, 2011. Retrieved May 8, 2011. ^ "Cramps prevented Pacquiao from scoring KO". Inquirer.net. May 8, 2011. Archived from the original on May 11, 2011. Retrieved May 8, 2011. ^ "Mayweather Says Mosley Advised Him To Make Pacquiao Take The Tests". Fighthype.com. June 30, 2011. Retrieved August 10, 2011. ^ "Up Next For Pacquiao? Marquez, Bradley Or Judah In November Says Arum". Fighthype.com. May 8, 2011. Retrieved August 10, 2011. ^ Marquez: I've Accepted The Pacquiao Offer, 144-Pounds – Boxing News. Boxingscene.com (October 5, 2011). Retrieved on May 19, 2012. ^ Boxing | Manny Pacquiao beats Juan Manuel Marquez.... Stuff.co.nz (November 13, 2011). Retrieved on May 19, 2012. ^ Smith, Tim (November 13, 2011). "Judges KO Pacquiao foe". Daily News. New York. ^ Manny Pacquiao escapes with decision against Juan Manuel Marquez – ESPN. Espn.go.com (November 13, 2011). Retrieved on May 19, 2012. ^ No, Marquez was not 'robbed' vs. Pacquiao. ESPN New York. Retrieved on May 19, 2012. ^ Manny Pacquiao to face Timothy Bradley in a June welterweight title bout – Boxing – Yahoo! Sports. Sports.yahoo.com. Retrieved on May 19, 2012. ^ WBO Best Fighter Of The Decade. wboboxing.com. Retrieved on June 18, 2012. ^ "Manny Pacquiao shocked in split-decision loss to Timothy Bradley Jr". ESPN.com. ^ SKRETTA, DAVE. "WBO to review Pacquiao-Bradley title bout". Yahoo Sports. Archived from the original on June 26, 2012. Retrieved June 14, 2012. ^ "Pacquiao wants rematch with Bradley". Fox Sports Net. Associated Press. June 20, 2012. Retrieved June 21, 2012. ^ "Manny Pacquiao beats Brandon Rios in unanimous decision". ESPN.com. ^ Velin, Bob (April 13, 2014). "Manny Pacquiao leaves no doubt, beats Timothy Bradley". USA Today. Retrieved April 13, 2014. ^ "Manny Pacquiao knocks down Chris Algieri six times in lopsided decision win". sports.yahoo.com. Retrieved November 23, 2014. ^ "Boxing's Biggest Disappointment: What Went Wrong in Pacquiao vs Mayweather". Remezcla. ^ Davies, Gareth A (May 5, 2015). "Mayweather vs Pacquiao: Rematch hopes hit by Manny shoulder injury – live". Telegraph.co.uk. London. ^ "Americans jeer Mayweather, express disappointment online". gmanetwork.com. ^ "New Stats Show Floyd Mayweather Didn't Win Fight Against Manny Pacquiao". The Inquisitr News. Retrieved May 2, 2016. ^ "REVEALED: Mayweather fortunate to beat Pacquiao by unanimous decision". Daily Mail. London. May 11, 2015. ^ "Boxing's Fight for Relevance". The Players' Tribune. Retrieved May 2, 2016. ^ "Mayweather vs. Pacquiao: Replay tells another story". Boxing News 24. ^ "Mayweather-Pacquiao fight: Floyd Mayweather wins by unanimous decision". Washington Post. May 3, 2015. ^ "Manny Pacquiao unanimous decision Mayweather Wins". Pilipinas Daily. ^ Luke Thomas. "Mayweather vs. Pacquiao earns a record 4.4 million pay-per-view buys". MMA Fighting. ^ a b "Floyd Mayweather caught using illegal IV injections day before win over Manny Pacquiao! – Daily Mail Online". Mail Online. September 10, 2015. Retrieved May 2, 2016. ^ a b c "Floyd Mayweather denies wrongdoing for IV before Manny Pacquiao fight". ESPN.com. Retrieved May 2, 2016. ^ Lyle Fitzsimmons. "Arum Reflects on Mayweather's IV, Pacquiao Shoulder Shot Scandal". BoxingScene. ^ "Arum names 3 possible opponents for Pacquiao's ring return". Rappler. Retrieved May 2, 2016. ^ Tony Mogan. "Manny Pacquiao to retire after final fight in 2016: Amir Khan and Floyd Mayweather possible opponents". International Business Times UK. Retrieved May 2, 2016. ^ "Manny Pacquiao chooses Timothy Bradley for rubber match". Desert Sun. December 30, 2015. Retrieved May 2, 2016. ^ Peter Gilbert. "Manny Pacquiao: Timothy Bradley will be my last fight". Sky Sports. Retrieved May 2, 2016. ^ "Pacquiao explains why he selected Bradley for April 9th fight". Boxing News 24. Retrieved May 2, 2016. ^ "Bello formally petitions Comelec to stop Manny Pacquiao fight on April 9 against Bradley". Sports Interactive Network Philippines. Associated Press. February 22, 2016. Archived from the original on February 25, 2016. Retrieved February 23, 2016. ^ Maragay, Dino (February 23, 2016). "Arum: Pacquiao fight not in conflict with elections". The Philippine Star. Retrieved February 23, 2016. ^ Chandler, Michael J. (April 10, 2016). "Pacquiao tops Bradley by UD in vintage display". The Score. Retrieved April 10, 2016. Still the only Eight-Division world champion, Pacquiao's 10 titles paired with the honor of being the first to capture the lineal championship in five different weight classes sets him apart. ^ "MGM Grand Results – Pacquiao Outclasses Bradley in Trilogy Closer". The Sweet Science. April 9, 2016. ^ Hogg, Dave (April 10, 2016). "Manny Pacquiao makes history in retirement bout". TodaysKnockout.com. Retrieved May 27, 2016. Manny Pacquiao never got his rematch with Floyd Mayweather Jr., but on Saturday night, he did something that Mayweather never accomplished. By beating Timothy Bradley in his last fight, Pacquaio claimed the vacant linear welterweight title and became the first boxer to win the true championship in five different weight classes. Fittingly, he ended his career by breaking the record he shared with Mayweather. ^ Law, MJ (June 2010). "Weight a minute!". The Lineal Champs. Retrieved June 21, 2016. ^ Manny Pacquiao's Historic 5th Crown. BoxingScene (April 11, 2016). Retrieved on 2016-06-25. ^ Law, MJ (July 2010). "Manny's Milestone (and Mayweather's too)". The Lineal Champs. Retrieved July 8, 2016. ^ "Manny Pacquiao retires after beating Timothy Bradley by unanimous decision". Yahoo Sports. April 10, 2016. Retrieved May 2, 2016. ^ Kevin Iole (June 30, 2016). "Bob Arum believes Manny Pacquiao 'wants to return'". Yahoo! Sports. Retrieved July 23, 2016. ^ Dino Maragay (July 12, 2016). "Pacquiao planning to file Senate leave to fight, says Arum". Philstar. Retrieved July 23, 2016. ^ Ryan Burton (July 11, 2016). "Arum: Broner is Out, Priced Himself Out For Pacquiao Fight". Boxing Scene. Retrieved July 23, 2016. ^ Chris Williams (June 25, 2016). "Arum holding October 15 date for Pacquiao comeback". BoxingNews24. Retrieved July 23, 2016. ^ Camille Elemia (July 13, 2016). "Manny Pacquiao denies plans to take Senate leave for boxing". Rappler. Retrieved July 23, 2016. ^ Lance Pugmire (July 18, 2016). "Manny Pacquiao's fight date will be Nov. 5, promoter says". LA Times. Retrieved July 23, 2016. ^ Leo Reyes (July 23, 2016). "Senate President clears Manny Pacquiao to fight again". Digital Journal. Retrieved July 23, 2016. ^ Des Bieler (July 12, 2016). "Manny Pacquiao plans on fighting again this fall, promoter says". Washington Post. Retrieved July 23, 2016. ^ "Pacquiao to fight Jesse Vargas in November comeback fight". Sky Sports. August 4, 2016. Retrieved August 4, 2016. ^ "Arum Says Vargas Fight Not Set Until Pacquiao Deal is Reached". Boxing Scene. August 4, 2016. Retrieved August 4, 2016. ^ "Pacquiao: I Have Agreed To Fight Jessie Vargas on November 5". Boxing Scene. August 9, 2016. Retrieved August 9, 2016. ^ "Manny Pacquiao confirms comeback with Jessie Vargas fight". Sky Sports. August 10, 2016. Retrieved August 10, 2016. ^ "Arum might self-distribute Pacquiao vs. Vargas". BoxingNews24. August 18, 2016. Retrieved August 19, 2016. ^ "Report: HBO Refuses to Put Pacquiao-Vargas on PPV". Sherdog.com. August 19, 2016. Retrieved August 19, 2016. ^ Lance Pugmire (August 18, 2016). "Bob Arum slams HBO for not distributing Manny Pacquiao's next pay-per-view". LA Times. Retrieved August 19, 2016. ^ Steve Kim (September 9, 2016). "Arum: HBO Made Their Choice, Pacquiao Contract Is Terminated". BoxingScene. Retrieved September 9, 2016. ^ Nissi Icasiano. "Pacquiao-Vargas bout to be distributed by Top Rank's PPV arm after HBO snub". Rappler. Retrieved September 9, 2016. ^ "Stephen A. Smith / Brian Kenny / Charissa Thompson to Call Pacquiao-Vargas PPV". BoxingNews24. Retrieved September 26, 2016. ^ "Mayweather seated ringside for PacMan fight". ESPN.com. 2016-11-06. Retrieved 2018-12-29. ^ "Pacquiao wins WBO welterweight title in front of Mayweather". Forbes. ^ "Pacquiao vs. Vargas: Scorecard Results, Complete Punch Stats and Breakdown". Bleacher Report. ^ "Pacquiao dominates Vargas in return, wins belt". ESPN.com. 2016-11-06. Retrieved 2018-12-29. ^ "PACQUIAO VS. VARGAS PURSE: PRIZE-MONEY PAYOUTS AFTER MAIN EVENT FIGHT". Bleacher Report. ^ "Manny Pacquiao and Amir Khan to fight in April". BBC. 26 February 2017. Retrieved 26 February 2017. ^ "Manny Pacquiao and Amir Khan announce April 23 'super fight'". The Telegraph. 26 February 2017. Retrieved 26 February 2017. ^ "Terms agreed and UAE in the driving seat to host Manny Pacquiao v Amir Khan 'super fight' on April 23 | The National". Retrieved 2017-02-27. ^ "Pacquiao, Khan announce they'll fight in April". ESPN.com. Retrieved 2017-02-27. ^ "Three UAE venues in the frame for Pacquiao-Khan". ESPN.com. Retrieved 2017-02-27. ^ "Pacquiao vs. Khan Will Happen in UAE, Says Michael Koncz - Boxing News". www.boxingscene.com. Retrieved 2017-02-27. ^ "Amir Khan to fight Manny Pacquiao in April". Sky Sports. Feb 26, 2017. Retrieved Feb 27, 2017. ^ "Manny Pacquiao and Amir Khan to fight in April". BBC Sport. 2017-02-26. Retrieved 2017-02-27. ^ "Pacquiao vs. Khan on May 19, Says Koncz After Arum Meeting - Boxing News". www.boxingscene.com. Retrieved 2017-03-01. ^ "Date for Manny Pacquiao and Amir Khan fight no closer to being agreed". Sky Sports. March 2, 2017. Retrieved March 2, 2017. ^ "Manny Pacquiao v Amir Khan in UAE: Venue decided and confirmation expected in coming days | The National". Retrieved 2017-03-02. ^ "Amir Khan's fight against Manny Pacquiao 'called off'". ITV News. Retrieved 2017-03-08. ^ "Deal 'dead' for announced Pacquiao-Khan fight". ESPN.com. Retrieved 2017-03-08. ^ "Amir Khan-Manny Pacquiao's proposed UAE fight 'dead' - promoter Bob Arum". BBC Sport. 2017-03-08. Retrieved 2017-03-08. ^ a b "Manny Pacquiao vs Jeff Horn is back on, likely for July". International Business Times AU. 2017-03-27. Retrieved 2017-04-04. ^ "Arum: Pacquiao Close To Signing Contract, Horn Signed His - Boxing News". www.boxingscene.com. Retrieved 2017-04-04. ^ News, ABS-CBN. "Arum: 'Everything is done' for Pacquiao-Horn fight". ABS-CBN News. Retrieved 2017-04-04. ^ "Arum Provides Update on Manny Pacquiao vs. Jeff Horn Deal - Boxing News". www.boxingscene.com. Retrieved 2017-04-04. ^ "Pacquiao signs to fight Horn • Boxing News". Boxing News. 2017-04-07. Retrieved 2017-04-07. ^ "Horn-Pacquiao bout to bring $24 mil to Qld". news. Retrieved 2017-04-10. ^ "Horn promoter: Pacquiao fight set for July 2". ESPN.com. Retrieved 2017-04-10. ^ "Pacquiao vs. Horn Officially Announced By Bob Arum - Boxing News". www.boxingscene.com. Retrieved 2017-04-11. ^ "40,000 tickets already sold for Pacquiao-Horn • Boxing News". Boxing News. 2017-06-01. Archived from the original on 2017-06-04. Retrieved 2017-06-01. ^ "Pacquiao-Horn To Air Live on ESPN, 9PM ET/6PM PT - Boxing News". www.boxingscene.com. Retrieved 2017-06-20. ^ "Jeff Horn Shocks Manny Pacquiao in Blood-Filled Upset! - Boxing News". www.boxingscene.com. Retrieved 2017-07-02. ^ "Manny Pacquiao: Jeff Horn wins WBO welterweight title in Brisbane". BBC Sport. 2017-07-02. Retrieved 2017-07-02. ^ a b Blair, Alex (3 July 2017). "Jeff Horn defeats Manny Pacquiao: 'Ridiculous' decision blasted by US". news.com.au. ^ "Horn takes Pacquiao's title in stunning upset". ESPN.com. Retrieved 2017-07-02. ^ Gallo, D. J. (2017-07-02). "Jeff Horn stuns Pacquiao in WBO welterweight world title fight – as it happened". The Guardian. ISSN 0261-3077. Retrieved 2017-07-02. ^ "Manny Pacquiao vs. Jeff Horn: LIVE Round By Round Scorecard, Preview And Recap For Boxing Event". International Business Times. 2017-07-01. Retrieved 2017-07-02. ^ "Manny Pacquiao vs Jeff Horn scorecard - Boxing News". www.boxingscene.com. Retrieved 2017-07-02. ^ "Jeff Horn scores controversial upset of Manny Pacquiao via unanimous decision". CBSSports.com. Retrieved 2017-07-02. ^ "The Press Scores For Manny Pacquiao Vs Jeff Horn Tell You All You Need To Know". www.punditarena.com. Retrieved 2017-08-01. ^ "Jeff Horn defeats Manny Pacquiao". mmadecisions.com. 2014-07-02. Retrieved 2017-07-03. ^ "WBO will rescore controversial Pacquiao vs. Horn fight but result won't change". CBS Sports. 7 July 2017. ^ "Manny Pacquiao Jeff Horn re-score results: WBO statement, scorecards from title fight review". Fox Sports. 2017-07-11. Retrieved 2017-07-11. ^ "Arum Reacts To WBO Backing Horn's Shocker Over Pacquiao". ^ "Manny Pacquiao: Jeff Horn defeat will not stop legend fighting". BBC Sport. 2017-07-12. Retrieved 2017-07-12. ^ "Manny Pacquiao 'not surprised' by WBO review result of Jeff Horn loss". Sky Sports. Retrieved 2017-07-12. ^ "Manny Pacquiao Return Being Lined Up For Crawford-Horn Card". BoxingScene.com. Retrieved 2018-04-10. ^ "Arum: Pacquiao, Crawford-Horn Double Would Be ESPN PPV". BoxingScene.com. Retrieved 2018-04-10. ^ "Manny Pacquiao's Return is Set? Mike Alvarado Rumored as Foe". BoxingScene.com. Retrieved 2018-04-10. ^ "Roach Embraces The Idea of Manny Pacquiao vs. Lucas Matthysse". BoxingScene.com. Retrieved 2018-04-10. ^ "Pacquiao vs. Matthysse: Golden Boy Prez Eager To Make a Deal". BoxingScene.com. Retrieved 2018-04-10. ^ "Arum: Pacquiao-Matthysse Can Happen Later, But Not in April". BoxingScene.com. Retrieved 2018-04-10. ^ "Pacquiao Felt Insulted, Walks From Alvarado Bout on April 14". BoxingScene.com. Retrieved 2018-04-10. ^ "Manny Pacquiao: I Will Fight in Malaysia in May or June". BoxingScene.com. Retrieved 2018-04-10. ^ "Arum: Pacquiao Hasn't Finalized Matthysse Fight for June 24". BoxingScene.com. Retrieved 2018-04-10. ^ "Pacquiao Starts Training For Potential Matthysse Showdown". BoxingScene.com. Retrieved 2018-04-10. ^ "Pacquiao-Matthysse Reportedly Postponed From June 24 to July 8". BoxingScene.com. Retrieved 2018-04-10. ^ "Manny Pacquiao vs. Lucas Matthysse a Done Deal For July 14". BoxingScene.com. Retrieved 2018-04-10. ^ "Pacquiao to challenge Matthysse for title in July". ESPN.com. Retrieved 2018-04-10. ^ "Pacquiao May Use Buboy as Trainer For Matthysse, Says Koncz". BoxingScene.com. Retrieved 2018-04-10. ^ "Manny Pacquiao parts ways with Freddie Roach ahead of Lucas Matthysse bout - The Ring". The Ring. 2018-04-13. Retrieved 2018-04-14. ^ "Pacquiao vs. Matthysse Having Issues, To Be Postponed?". BoxingScene.com. Retrieved 2018-07-03. ^ "Pacquiao Denies Reports of Issues With Matthysse Fight". BoxingScene.com. Retrieved 2018-07-03. ^ "Pacquiao: Ignore What Arum Said, He's Old, My Fight Will Happen". BoxingScene.com. Retrieved 2018-07-03. ^ "Matthysse Receives His Money, Heads To Malaysia on Tuesday". BoxingScene.com. Retrieved 2018-07-03. ^ "Pacquiao Knocks Matthysse Out in Seventh For WBA Belt". BoxingScene.com. Retrieved 2018-07-17. ^ "Pacquiao stops Matthysse for 1st KO since '09". ESPN.com. Retrieved 2018-07-17. ^ "Manny Pacquiao vs. Lucas Matthysse - CompuBox Punch Stats". BoxingScene.com. Retrieved 2018-07-17. ^ "Lucas Matthysse Makes Decision To Retire From Boxing". BoxingScene.com. Retrieved 2018-08-03. ^ "Source: Pacquiao-Broner does 400K buys on PPV". ESPN.com. 2019-01-24. Retrieved 2019-03-25. ^ "Pacquiao-Broner Produces $6 Million Gate, 11,410 Tickets Sold". BoxingScene.com. Retrieved 2019-03-25. ^ "WBO TO MAKE A SPECIAL BELT FOR PACQUIAO-RIOS WINNER". WBO. Retrieved May 2, 2016. ^ "Pacquiao, Rios dispute special belt". The Standard. Retrieved May 2, 2016. ^ Scott Christ (July 29, 2013). "Pacquiao vs Rios: 'Special belt' to be awarded to winner of second-rate title". Bad Left Hook. Retrieved May 2, 2016. ^ "Pacquiao vs. Rios WBO Belt Adorned With Swarovsky Crystals - Philippine News". 23 November 2013. ^ "Pacquiao gets "super-belted" in Philippines". Boxing News. Archived from the original on 2016-04-20. Retrieved May 2, 2016. ^ "PACQUIAO RECEIVES WBO SUPER CHAMPION BELT (PHOTOS)". WBO. Retrieved May 2, 2016. ^ "WBA "Man of Triumph" Trophy". Retrieved May 2, 2016. ^ Nathanielsz, Ronnie (April 30, 2015). "WBA HAS ITS OWN TROPHY FOR WINNER OF 'FIGHT OF THE CENTURY'". PhilBoxing.com. ^ "'Legacy' belt awaits winner of Pacquiao-Bradley bout". philstar.com. Retrieved May 2, 2016. ^ a b c "Pacquiao-Morales trilogy combines for $49.5 million". Espn.go.com. ^ "PACQUIAO-BARRERA HAD ALMOST 350,000 PPV BUYS". Philboxing. ^ Greg Beacham. "Pacquiao's win over Marquez generates record PPV numbers for lower weights". USA Today. ^ Scott Christ. "HBO releases official PPV numbers: 1.25 million". Bad Left Hook. ^ "Fight generates $70M in TV revenue". Espn.go.com. ^ "Pacquiao-Hatton PPV numbers something to celebrate, even if Arum refuses". ^ "Pacquiao-Cotto tops Mayweather in PPV". Espn.go.com. ^ "Pacquiao-Clottey earns big PPV bucks". Espn.go.com. ^ "Manny Pacquiao generates another 1 million PPV buys". Sports.espn.go.com. November 23, 2010. Retrieved November 3, 2011. ^ "Bout draws more than 1.3 million buys". Espn.go.com. ^ "Pacquiao vs Marquez III draws 1.4 million PPV". BoxingNews24. December 13, 2011. Retrieved November 3, 2011. ^ Rick Reeno. "Arum: Pacquiao vs. Bradley Buyrate To Go Over 900K". Boxing Scene. ^ "Pacquiao-Marquez IV exceeds 1 millions buys". espn.go.com. Retrieved December 15, 2012. ^ "Pacquiao vs Algieri PPV price, walk-in-the-ring time". FightSaga.com. ^ "HBO's Taffet Still Stunned By 4.6M Buys For May-Pac". Retrieved May 2, 2016. ^ Bob Arum: Pacquiao-Vargas fight surpassed 300K PPV buys; Is Pacquiao-Mayweather II possible?. USA Today (November 15, 2016). Retrieved on November 15, 2016. ^ "Pacquiao vs Vargas: PPV cost, streamimg info". FightSaga.com. ^ "Pacquiao-Broner PPV sales hit 400,000, earn $30 million". news.abs-cbn.com. Retrieved February 21, 2019. ^ "Pacquiao vs Mosley Could Be Highest-Selling Pacquiao PPV Ever". Bad Left Hook. Vox Media. SB Nation. May 12, 2011. ^ a b "Mayweather-Pacquiao KO's PPV marks, live gate". ESPN. May 12, 2015.